It breaks my heart to say it, but before we started the NACD program Luke was like a wild animal. He dashed here and there, climbed on tables and cabinets, jumped off and started all over again. He rocked precariously on the seat and back of a recliner while watching television, lined and stacked things, jumped on the couch, then scattered all the cushions around the living room, and began all over again. Because of his climbing, all appliances, bookshelves, and entertainment centers in the home were securely bolted to the wall so they wouldn’t fall and crush him. Indifferent to our efforts to teach and discipline him, each waking moment of his day Luke found innumerable ways to get into mischief. The hardest part for me was constantly having to keep an eye on him, or within seconds he would disappear. One time he snuck out the door, scaled a wooden fence, and clad in only a diaper, strolled casually across the street and around the block. Another time, we lost sight of him for just a moment only to see that he had climbed up a ladder and onto the roof of the house. We worried so much that he would vanish in the middle of the night that we purchased a king size bed and had him sleep between us until he was eight years old. At home we somehow managed to corral him and keep him safe, but going in public with Luke was our worst nightmare. I had to put him into a baby sling on my body when going to the grocery store, which he hated, and he would fight me to get out the entire time I was there. I would go home completely exhausted from the trip. He constantly wanted to run around no matter where we were, and we never knew what he would do to embarrass us—not intentionally, of course. He had no idea what he was doing; it was as if he was acting on pure instinct. He didn’t interact with anyone, had no language, and made no eye contact. We weren’t even sure whether he knew who we were; he seemed unaware that we were present. Before his diagnosis, a couple of times we left him with a trusted sitter, but he never noticed that we were gone and displayed no emotion to us coming home like our daughter would. Looking into his eyes, all we met was emptiness, there was no recognition of anything. Naturally, we knew something was wrong early on, but the autism diagnosis was devastating nonetheless. I cried when the psychologist pronounced that Luke was “retarded” and would always be this way, that there was nothing we could do, that we should go home and mourn our child because he would never get better. “Even worse,” she said, “when Luke gets older and becomes aggressive you’ll have to institutionalize him.” We could not, would not accept such a grim, despondent projection. We had recently read an article in a magazine about a child with autism getting better with some therapy, so we knew something was out there for our son. Somewhat reluctantly, and only after we insisted that help was out there, did the psychologist refer us to an Applied Behavior Analysis (ABA) therapist. It was this provider who a few months later introduced us to NACD, and she herself began working with NACD. We met Bob Doman when Luke was nearly four years old and was at the peak of severe sensory dysfunction. To cope with the pain caused by sounds, Luke had developed the ability to tune out the world so completely that he couldn’t hear anything or anyone anymore. He didn’t have normal feeling in his lower body, and despite his incessant running and climbing, he had low muscle tone in his arms and legs. His knees and ankles were falling inward, as if there were no muscles supporting them, and as he ran his limbs flailed awkwardly away from his body. His skin was so hyposensitive that walking on rocks or other sharp objects triggered no discomfort. All that began to change once we started the NACD program. My husband went to work, my older daughter attended school, and I spent the days working with Luke, marking off the checklist. Gradually, we noticed that Luke was becoming aware of what was going on around him. Once, when Luke was about 5 years old, I went to a performance at our daughter’s school and although I did my best to keep Luke quietly entertained, he somehow managed to wiggle away from my grip and darted onto the stage. I tried to coax him down to no avail. Finally, the school was forced to stop the play while I climbed onto the stage and dragged him out. Outside, I made him sit on the sidewalk next to me, and as I sobbed he stared at me with clarity. For the first time ever he recognized another person’s emotion and understood I was angry. At that moment, I knew without a doubt that what we were doing was right. After that, my son began hitting milestones that he had failed to achieve earlier and changed quickly. In the spring of 2001, just as he was turning four and in between his 2nd and 3rd visit with Bob, Luke finally said his first word and also potty-trained overnight—one day he was wearing diapers, the next he didn’t. After several years of no real development, we were beyond ecstatic as he hit these two crucial developmental hurdles so quickly. As we continued with implementing the program, his speech and language improved, he began learning to sit still and wait for his turn, stopped spinning and rocking, and came to recognize pain. He cried when he got scraped and walked tenderly over rough surfaces. The NACD exercises helped develop arches in his feet, normalized his gate, and strengthened his muscle tone. Now at seventeen, Luke is a fine young man. Except for about a month in a special education preschool, he has always been homeschooled, following the NACD program. He is not “retarded” and in fact does quite well academically. He has perfect pitch and plays the piano beautifully. He reads music and after only three years in piano lessons is performing challenging classical compositions. Luke also enjoys cooking. Although he makes practical dishes, his cooking specialties are fry bread and chocolate chip cookies, which he makes with no assistance except for a recipe card. Luke is highly capable of taking care of himself and goes through personal care routines independently, which includes dressing appropriately for the day and being ready to leave on time when we are going somewhere. He skillfully performs many household chores, mostly without complaining. Occasionally, he expresses typical teen attitudes and may raise his voice a little, but unlike what the psychologist anticipated, he is never aggressive. Just the opposite—he is generally so easygoing that other kids try to boss him, which of course irritates him; but he is able to control himself and doesn’t lash out. Luke is not a big sports fan, but he loves participating in karate in a class with typical kids. He is attentive, hardworking, and compliant with the rules. 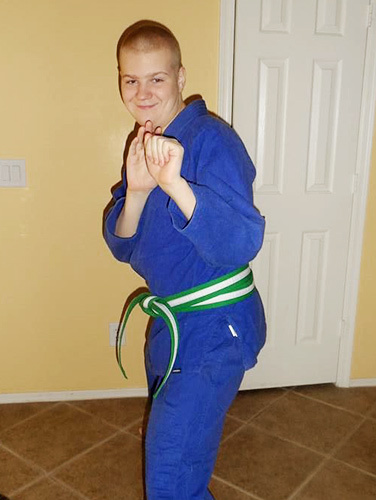 When he earned his green belt stripe, he came up with a plan to earn a full green belt by a specific date. On his own initiative, he wrote down a week-by-week schedule of what he needed to learn in order to reach his goal. And he did! Amazingly, he also received an A on the test which is not easy to do at this high of a level. He is now working toward brown belt and is highly motivated. It’s wonderful seeing Luke strive toward an objective he has set for himself!